Staphylococci remain the most important cause of hospital-acquired infections in the U.S. and MRSA has become the most common cause of skin and soft tissue infection in many parts of the world. 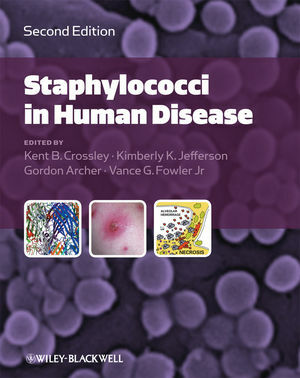 There is now a much greater understanding of the physiology and evolution of the staphylococci and this new edition reflects the rapid advancements in knowledge about this pathogen and provides a comprehensive review from both clinical and basic science perspectives. The first section addresses the basic biology of the staphylococci, their molecular genetics, host defenses and host evasion, virulence determinants, mechanisms of antibiotic resistance, and laboratory techniques. The second section deals with epidemiology, and the third section provides an overview of the varied clinical manifestations of human staphylococcal infections. The fourth section covers prevention and treatment of these often life-threatening infections. Written by experts from around the globe, this book is essential reading for all clinicians and basic scientists studying the staphylococci. Section I: The Organisms Biology and Taxonomy. 1 The biology of staphylococci (Greg A. Somerville and Richard A. Proctor). 2 Genomics of the Staphylococci. (Steven R. Gill). 3 The evolution and taxonomy of staphylococci (Barry N. Kreiswirth, Barun Mathema, José R. Mediavilla and Liang Chen). 4 The molecular basis of pathogenicity (Mark S. Smeltzer, Chia Y. Lee, Nada Harik and Mark E. Hart). 5 Adaptation to stress: biofilms and small colony variants (Karl M. Thompson and Kimberly K Jefferson). 6 Exotoxins (Patrick M. Schlievert, John K. McCormick, Gregory A. Bohach and Douglas H. Ohlendorf). 7 Host Defense Against Staphylococcal Infection. 7a The mechanism of host defense (Hattie D. Gresham). 7b Evasion of Host Defenses (Timothy J. Foster). 8 Resistance to beta-lactam antibiotics (Brigitte Berger-Bächi, Maria Magdalena Senn, Miram Ender, Kati Seidl, Judith Hübscher, Bettina Schulthess, Roni Heusser, Patricia Stutzmann Meier and Nadine McCallum). 9 Resistance to glycopeptides (Keiichi Hiramatsu). 10 Resistance to other agents (David C. Hooper and Jacob Strahilevitz). 11 Issues in the identification and susceptibility testing of staphylococci (Betty A. Forbes). Section II: Epidemiology of Staphylococcal Infection. 12 Colonization with Staphylococcus aureus and the role of colonization in causing infection (Henri A. Verbrugh). 13 Epidemiology of community-associated Staphylococcus aureus infections (Rachel J. Gorwitz and John A. Jernigan). 14 Epidemiology of Healthcare-Associated Staphylococcus aureus Infections (Andrew E. Simor and Mark Loeb). 15 Epidemiology of Coagulase-Negative Staphylococci and Infections Caused by these Organisms (Kathie L.Rogers, Paul D. Fey and Mark E. Rupp). Section III: Diseases Caused by Staphylococci. 16 Staphylococcus Aureus Bacteremia and Endocarditis (Zeina A. Kanafani, Sara E. Cosgrove and Vance G. Fowler Jr). 17 Surgical Site Infections and Surgical Prophylaxis (Deverick J. Anderson and Keith S. Kaye). 18 Infections of Intravascular Catheters and Vascular Devices (Hidetaka Yanagi and Robert J. Sherertz). 19 Skin and soft tissue infections (Martin E. Stryjewski, Esteban C. Nannini and G. Ralph. Corey). 20 Central nervous system infections (Karen L. Roos). 21 Diseases of the Eye (Linda A. Ficker). 22 Osteomyelitis and Other Bone and Joint Infections (Odette C. El Helou, Elie F. Berbari, and Douglas R. Osmon). 23 Staphylococcal Pneumonia (Ethan Rubinstein and Marin H. Kollef). 24 Urinary tract infections (S. Gatermann and Kent B. Crossley). 25 Toxic Shock Syndrome (Aaron DeVries). 26 Toxin-mediated syndromes (Tristan Ferry and Jerome Etienne). 27 Staphylococcal Diarrhea and Enterocolitis (Mark H. Wilcox). 28 Infections in Immunocompromised Patients (Lisa E. Davidson and Helen W. Boucher). 29 Clinical Manifestations of Community-Acquired MRSA Infections (Brian S. Schwartz and Henry F. Chambers). Section IV: Prevention and Treatment of Staphylococcal Infections. 30 Elimination of S. aureus carriage: Importance and strategies (Loreen A. Herwaldt and John M. Boyce). 31 Treatment of Staphylococcal Infections (Kent B. Crossley and Joseph John). 32 Vaccine-based strategies for prevention of Staphylococcus aureus infection (Adam C. Schaffer and Jean C. Lee).